This lively tale by the author of THE DREIDEL THAT WOULDN&apos;T SPIN is once again set in an old-fashioned toy shop in Prague. The main character is young Esther, named after Queen Esther, who is honored in the Jewish holiday of Purim for saving the Jewish people from cruel injustice in ancient Persia. Purim is the Jewish version of Halloween. Children dress up in silly costumes and go from house to house, but instead of collecting treats, they give gifts of food away. 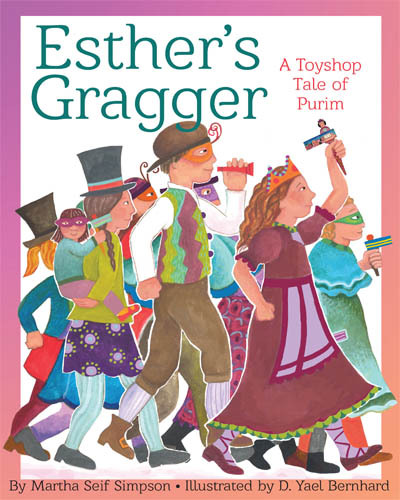 For her charitable activities giving gifts to the poor, young Esther is presented with a special gragger, or noisemaker, that is traditionally used to drown out the name of the evil character Haman during the telling of the Purim story. When a bully tries to take Esther&apos;s special gragger away from her, she uses the noisemaker to solicit support from the entire neighborhood. Shamed but unharmed, the bully is defeated — and even the shopkeeper learns an important lesson.